We’ve all been there. It’s 1:00 a.m. on a Saturday, you’re drunk and you really want Big Mamma’s. Problem is, that would involve walking there, and who the hell wants to do that? The good news is, all of your first world problem-related prayers have been answered in the form of OU Delivery. Founders include accounting and pre-law major Brandon Starr, entrepreneurship major John Zinno, restaurant, hotel and tourism major Tucker Holland, and business majors Aaron Hoffman, Robbie Mount and Matt Chadwick. 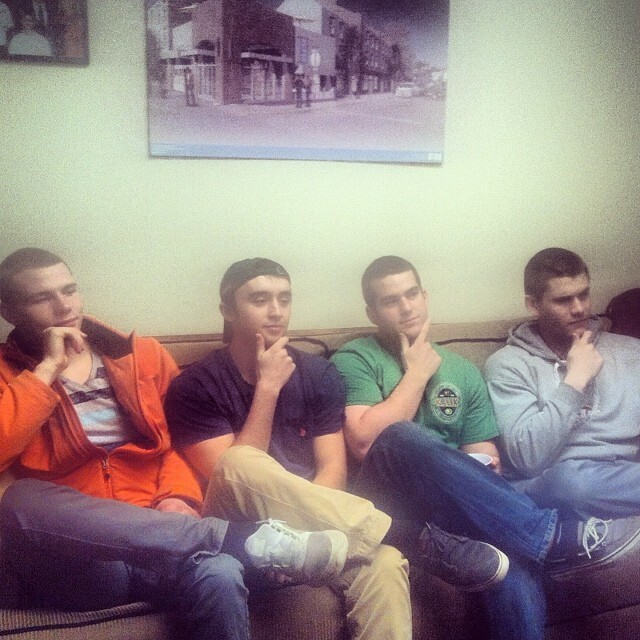 Several of the founding members sit and ponder. Photo credit: OU Delivery Instagram. The guys mostly deliver food, but their Twitter makes the claim that they can get you “just about anything.” No longer will you find yourself in those frustrating situations of the past. If you need an assorted 64 pack of crayons and several hundred VHS tapes, they’ve got you covered. (That might be a bit of an exaggeration, whatever). Here’s how it works: You text the item that you want, along with your name and address to one of their two numbers. For every order of 10 dollars or less, they charge 3 dollars. For every five dollars past the original 10 dollars, they add a dollar on top of the overall price. We were curious about some of the inner workings of the newly founded business, so we tracked down several founding members to learn a bit more. Q. How did this idea come about? A. Aaron Hoffman: I was walking to Shively Dining Hall getting food for my friend. It was cold outside and it was really just a burden to walk. I just thought that it would be easy to deliver food or anything to people for a small fee. It all stemmed from there. Q. Are you surprised by how quickly it blew up? Are you overwhelmed with the response? A. Brandon Starr: It’s honestly unreal. We had around 400 followers on Monday night and by Tuesday night we ended up with over 1800 followers. We have been overly excited with the response to our services and we love the amount of support we have had from Ohio University and the students. Q. I’m sure this is on everyones mind, so I have to ask. What about alcohol? A. Tucker Holland: With the legality of the situation we can not deliver alcohol as of now. Originally we knew it would be a huge opportunity but we realized that lots of licensing would be required for us to be able to do something like that. Q. Oh okay, maybe at some point? A. Tucker Holland: Yeah, we have looked into being able to deliver alcohol but there are a lot of hoops to jump through to be able to make that happen. We realize there is a high demand for it and we are hoping we can implement it in the near future. A. John Zinno: The goal obviously is to get as big as possible. Expansion, in my eyes, is definitely something we would like to accomplish in the very near future. We have a lot of promotional ideas that will be coming into play shortly, such as happy hour deliveries and possible half-off delivery charges. Twitter has been a game changer for our business and we plan to run contests off of our Twitter page as well. We also plan on contacting local businesses to work out potential partnerships. We aren’t sure what that entails yet but we will see what the future brings us. Q. What’s the weirdest thing you’ve had to deliver so far? A. Tucker Holland: Up to this point, we had to deliver an old spice stick of deodorant but I’m sure that it will get stranger as time goes on. Oddly enough, they had the most enthusiastic response to our services. Q. Any plans to implement credit cards? A. Brandon Starr: Absolutely. We have recently purchased Square credit card readers that will be available for on the go deliveries. We want to be able to implement credit card purchases as early as next week because we have had such a high demand for it. Q. What has been your most successful form of advertising? A. John Zinno: Definitely our Twitter page. We never even thought about paying for advertising because it’s obsolete to our generation. We’ve seen Twitter pages blow up like OUConfessions and OUCrushes in our time at Ohio University. We realized it was going to be our best form of advertising through word of mouth. Q. Do you plan on implementing social media in other ways? Any other forms of advertising you’re interested in? A. Brandon Starr: We already have a Facebook page that we created and it would be much appreciated if you liked our page. Other than that, we haven’t implemented any other social media instruments. We will have a website up really soon that will provide specials or deals that we are offering during the week and on the weekends. Have you used OU Delivery yet? Let us know what you think in the comments or tweet us @SpeakeasyMag!